Open Source Feature-Rich and Fully Supported! Feature-Rich and Fully Supported! For enthusiasts and developers that are happy to spend time and resource solving issues independently. For small businesses, teams or departments with additional features not found in the Community Edition. For businesses requiring a production-ready, warranted product with enterprise-class features. Available free under the open source GPL license. Fully supported by the Joget Team. Upgrade to Professional Edition now to receive professional support and features! Fully supported by the Joget Team. Upgrade to Enterprise Edition now to receive enterprise-class support and features! Click here to view the comparison between the Community, Professional and Enterprise Editions. Don’t want to worry about hosting? 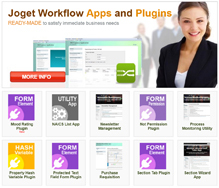 Sign up for free on Joget Workflow On-Demand.